Who knew that Malaysia is literally the love nest to so many sea turtles!? 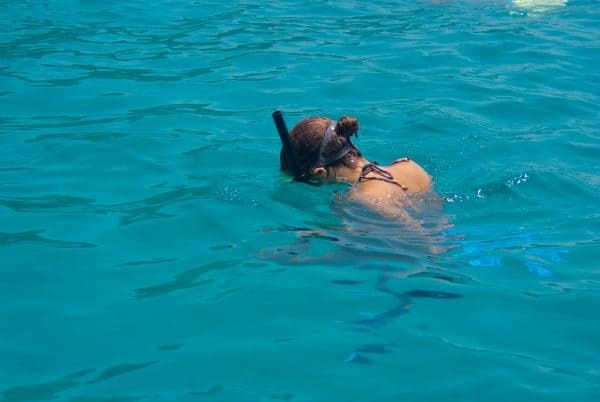 My first awareness of the existence of Malaysian Sea Turtles was from snorkeling encounters in the Perhentian Islands. The Perhentian Islands (Perhentian Kecil and Perhentian Besar) are located just off the east coast of Kota Bharu, Kelantan. The resort where I was staying, in Perhentian Besar, Terengganu had their waterfront roped off, preventing boats from entering the area. The sea turtles were quite visible in the clear waters of the Perhentians and comfortable hanging out just a short distance from the shore. It was easy to simply pop under the water and watch them. A fascinating experience and a fond travel memory for sure. Later I found out that four of the world’s seven species of sea turtles are found in Malaysia’s waters; Greens, Hawksbills, Leatherbacks and Olive Ridleys. 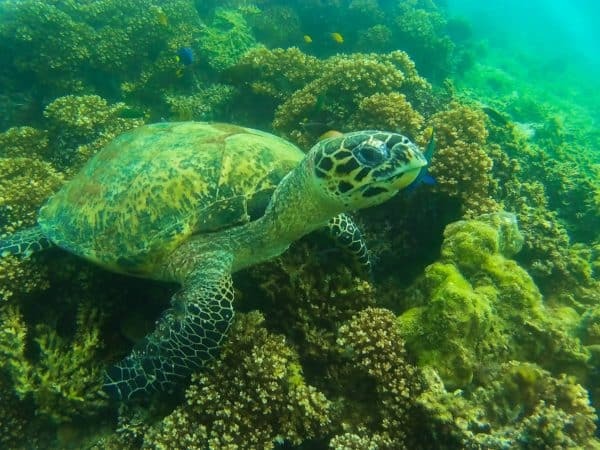 I also found out, that not all sea turtles follow the same agenda and that each species has its own specialty, which directly affects the eco balance of the various marine environments in Malaysia. 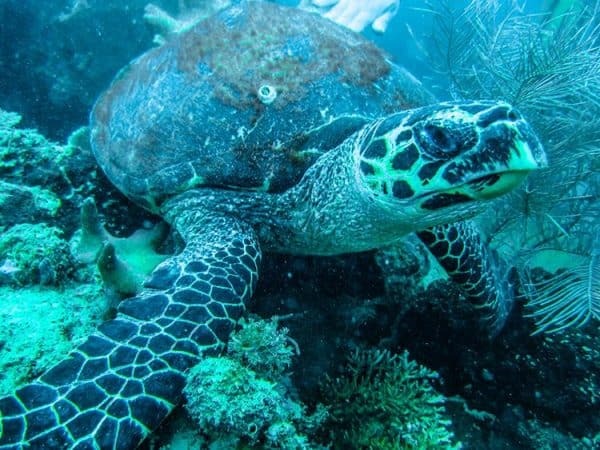 From eating sea grass, sponges and jelly fish to transporting nutrients for other marine life, sea turtles play an elemental part in the health of Malaysia’s oceans and coastlines. Known as Penyu Agar to the locals, the Green Turtle is the most abundant species in Malaysia. Referred to as ‘green’ because of the color of their cartilage and fat deposits (not the color of their shell). Their preferred Malaysia nesting grounds are the beaches and islands of Terengganu, Pahang, Johur, Perak, Sabah and Sarawak. Green Turtles are the lawn maintenance for sea grass beds. Sea grass and algae eaten by sea turtles is digested and the by-product (turtle poop if you will) provides nutrients for other sea dwellers, such as fish. In fact, a lot of those fish will be eagerly waiting near the sea grass for their next meal. 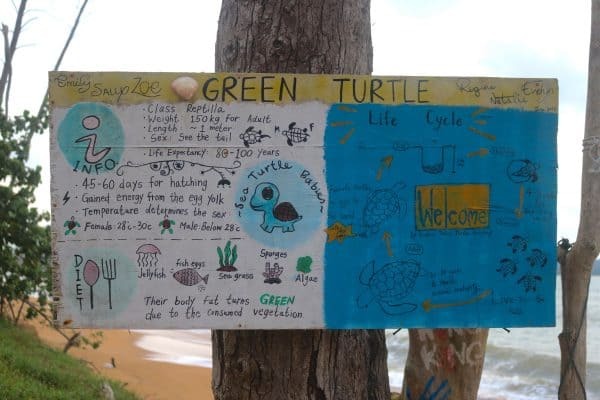 Green Turtle information board at Rimbun Dahan Turtle Hatchery, Cherating Beach. Green Turtle at Gaya Island, Kota Kinabalu, Malaysia. 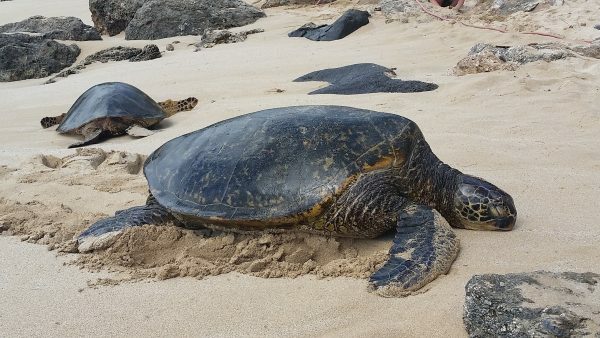 Pacific Green Turtles basking on a beach in Oahu. Hawksbill Turtles are known for their beautiful shells which have unfortunately been coveted for years, for use in creating jewelry and various ‘souvenirs’. Locally known as Penyu Karah or Penyu Sisik, the Hawksbills were given their official moniker due to their narrow pointed hawk-like nose. Sabah sees the largest population of Hawksbills with up to 500+ nests reported each nesting season. Malacca, Johor and Terengganu are also popular nesting grounds for the Hawksbill Turtles. Hawksbills are important to the preservation of coral reefs. Why? Because they eat sponges, which have the ability to suffocate corals by overgrowing them. It’s estimated that one Hawksbill Turtle can consume 1,000 pounds of sponges per year! But do note, apparently sponges contain an abundance of toxic chemical compounds, which of course gets stored in the Hawksbill Turtles’ body. Consuming their flesh is hazardous to humans; causing serious illnesses or worse. Leatherback Turtles are now facing extinction in Malaysia. Known as Penyu Belimbing to locals, Leatherbacks are the largest of all marine turtles. They are easily distinguished by their (you guessed it) ‘leathery’ shell and seven ridges which run the length of their shell. 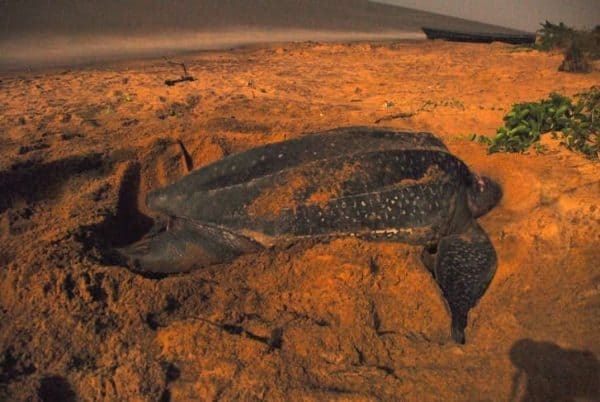 Terengganu was once the preferred nesting grounds of one of the largest Leatherback populations in the world, but unfortunately the numbers have dropped considerably in recent years. Leatherbacks are one of the most migratory of all marine turtles and will travel great distances to return to their birthplace for nesting. They are also known to love eating jelly fish, consuming up to 400 pounds per day. 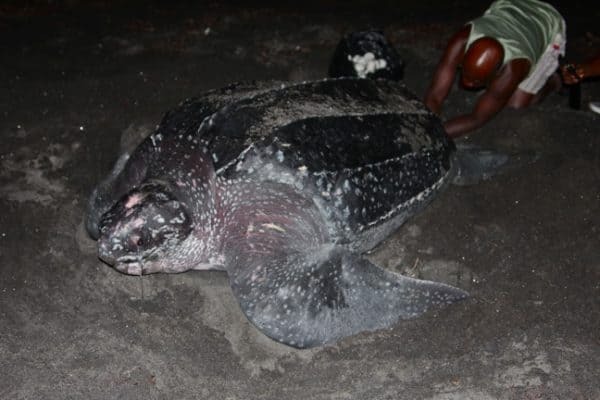 Leatherback laying eggs at Rosalie Bay Resort on the Caribbean island of Dominica. One of the smallest of all marine turtles is the endangered Olive Ridley (or Penyu Lipas). These migratory turtles often travel in groups, thousands of miles between feeding and nesting sites. They are occasionally seen in Sarawak, Penang, Terengganu and Kelantan. In Terengganu, no nesting activity has been reported in years, and you can read more about that HERE. Olive Ridley (babies) hatching in Costa Rica. Olive Ridley hatchling heading to sea. *A sea turtle can live 80-100 years. *Male sea turtles never (intentionally) leave the water. *Sea turtle gender can be dictated by the temperature of the sand the eggs are laid in; females 28c-30c males below 28c. *The male sea turtle’s tail is longer than the females. *It takes up to 30 years for a sea turtle to reach sexual maturity. Information board at Rimbun Dahan Turtle Hatchery in Cherating Beach, Pahang. *The female sea turtle will lay 70-140 eggs at a time. *It takes 45-60 days for a sea turtle egg to hatch. *When a baby turtle first heads to the sea, they will remember that sand as their ‘birth place’ and for females that means the location they themselves will return to lay their own eggs. *One baby turtle in 1,000 will ever make it to adulthood. *Sea turtles are now considered an endangered species. Reasons for the Decline in Malaysia’s Sea Turtle Population? Of the four species of sea turtles, which Malaysia plays host to, all are presently at risk of extinction. Why indeed are the number of sea turtles decreasing? Many things are generally uncontrollable. Ghost nets, marine predators, boat propellers and even weather are all erratic factors in the lifespan and survival of a sea turtle. But some things are controllable: the amount of plastic rubbish that sea turtles mistakenly consume, the protection of the sea turtles’ nesting grounds as well as the consumption, by humans, of turtle eggs and meat. Plastic bags look a lot like jelly fish. 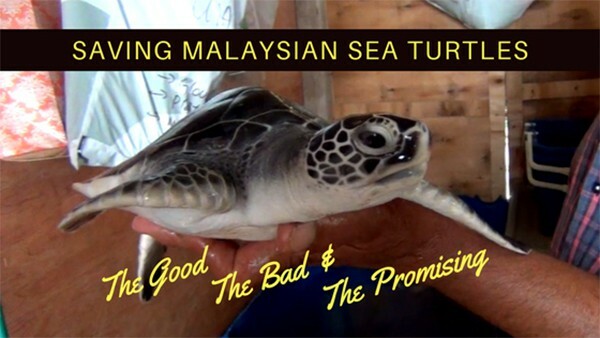 **The good news is that sea turtles are protected by Malaysian wildlife and fishery department laws. Several turtle hatcheries and conservation groups are also working around the clock to do everything they can to not only save the sea turtles, they are also sharing their knowledge with local communities; through voluntourism and community outreach programs. One man in Cherating Beach, Pahang is taking matters into his hands literally. Pak Su Cherating and the Rimbun Dahan Turtle Hatchery purchase turtle eggs from locals who deem egg selling as a viable income. He and his volunteers then re-nest (bury) the eggs within the sanctuary’s fenced- in protected nesting area. A turtle nursery if you will. They closely monitor the incubating eggs and hatchlings as well as the eventual releasing of the babies to the sea. There is a catch 22 to this. 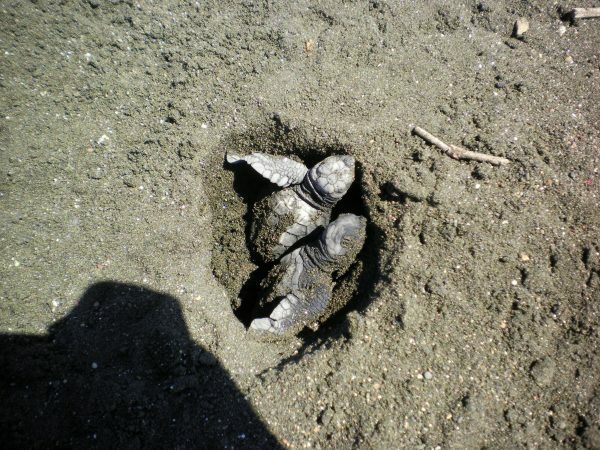 Locals are encouraged to dig up eggs, yet at the same time relocating the eggs to a hatchery increases the chance of the turtles’ survival. The extra ‘man power’ of sharp-eyed locals, also cuts down on the need for continuous night patrols by an already understaffed, non-profit hatchery. Unfortunately, not all have nature’s best interest at heart. Pak Su actually purchases the eggs with money from the hatchery or his own pocket. If no money, it is a rare occasion that the eggs will be donated to the sanctuary and will most likely be sold at a wet market. Re-nested eggs at Rimbun Dahan Turtle Hatchery, Cherating Beach, Pahang. And just for the record, a license to buy and sell eggs is obtainable for a small fee. But as I understand it, that license is offered to encourage locals to deliver the eggs to fishery or wildlife departments or licensed hatcheries. You can read more about that HERE. Eggs collected and re-nested are counted and dated to ensure there will be someone around to safely welcome the baby turtles to the world. I recently had the opportunity to finally meet Pak Su Cherating in person, after having a casual Facebook friendship for two years. He is considered the godfather of turtle conservation efforts in Malaysia and the go-to guy for turtle conservation information. It was also my first time to visit a turtle egg hatchery and understand more about their importance. Pak Su with 9-month old Zorro. 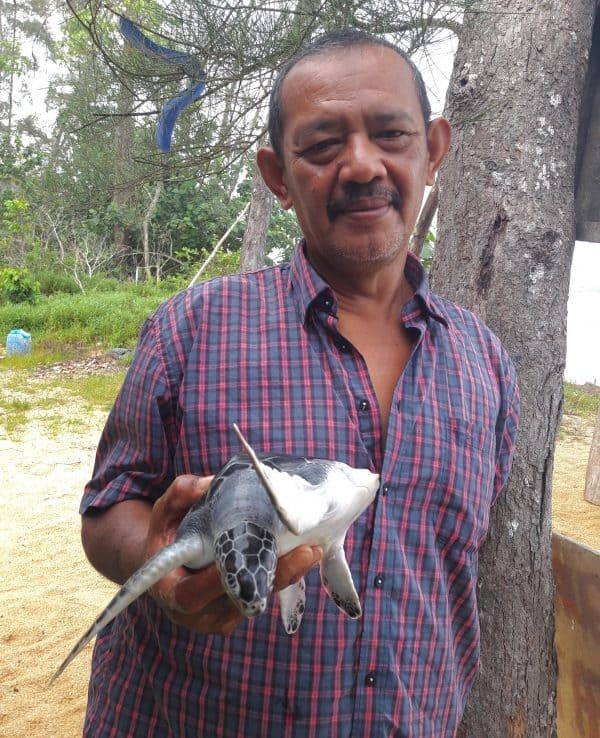 Pak Su has been a local front runner for turtle conservation for the past four years. His hatchery’s location has been ideal as Cherating Beach has not had too much beachfront development, yet. 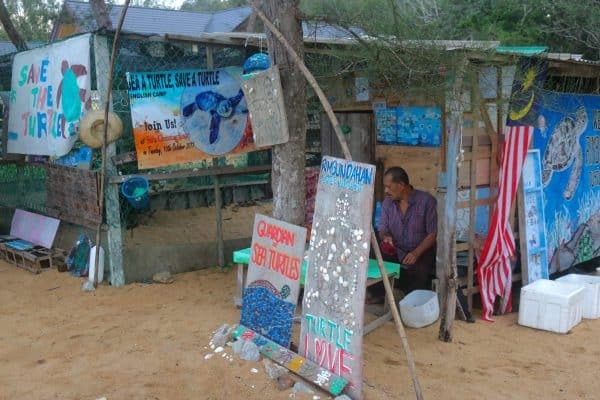 Since turtles are known to return to the beach from where they were born, Pak Su sees his fare share literally show up at the hatchery’s doorstep. This predictable turtle behavior makes it easier for turtle conservation teams in Malaysia to find and relocate the turtle nests to higher, more stable grounds, and monitor as well as protect the eggs from predators (including man). 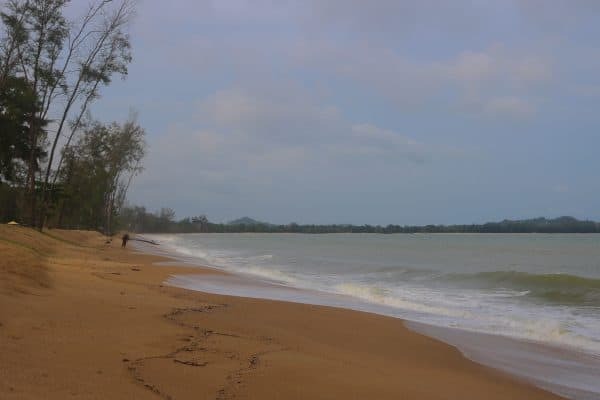 The beaches near to Cherating and Kemaman, are popular tourist destinations in Malaysia and are a favorite sea turtle nesting ground with over 1000 nests per year being reported. 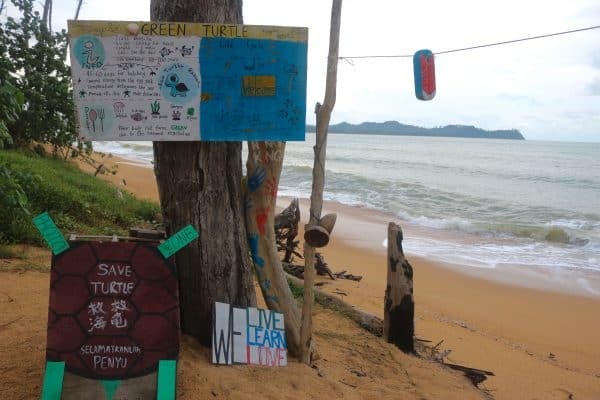 The location of the Rimbun Dahan Turtle Hatchery is, at this writing, within the property of Cherating Beach’s latest 5-star resort; The Kasturi. Cherating Beach has inviting golden beaches and emerald green waters. Kuddos to the folks at The Kasturi for allowing sea turtles to continue to nest on the grounds of their hotel’s beachfront. But with upcoming monsoon seasons and continuous beach erosion, there is a strong possibility that this eco-friendly arrangement has a limited lifespan. The hatchery will eventually be relocated to another area. Hopefully, not far from its present location. 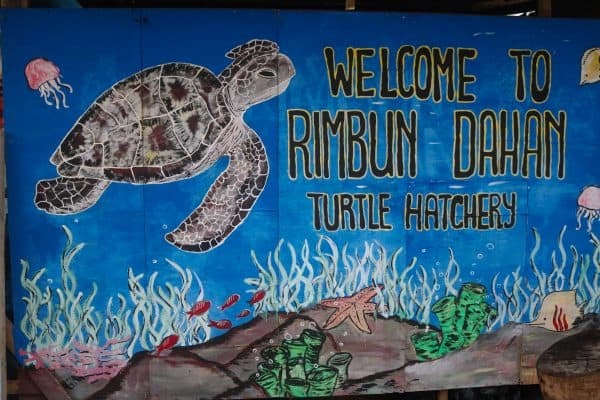 ** Update March 2019: Rimbun Dahan Turtle Hatchery has moved from their seafront location. 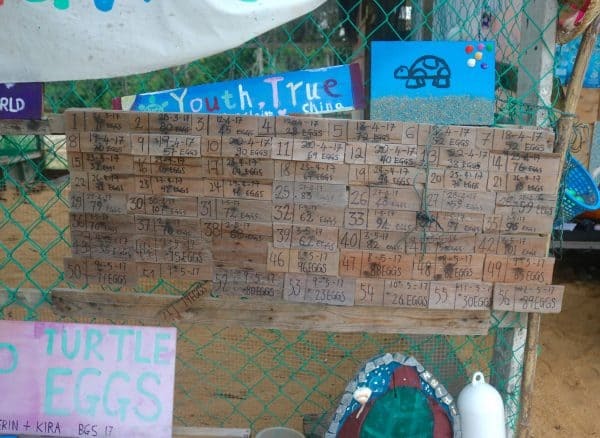 Volunteers show endless creativity, when it comes to saving turtles. Rimbun Dahan Turtle Hatchery runs volunteer programs for those who are interested in working hands on in turtle conservation. 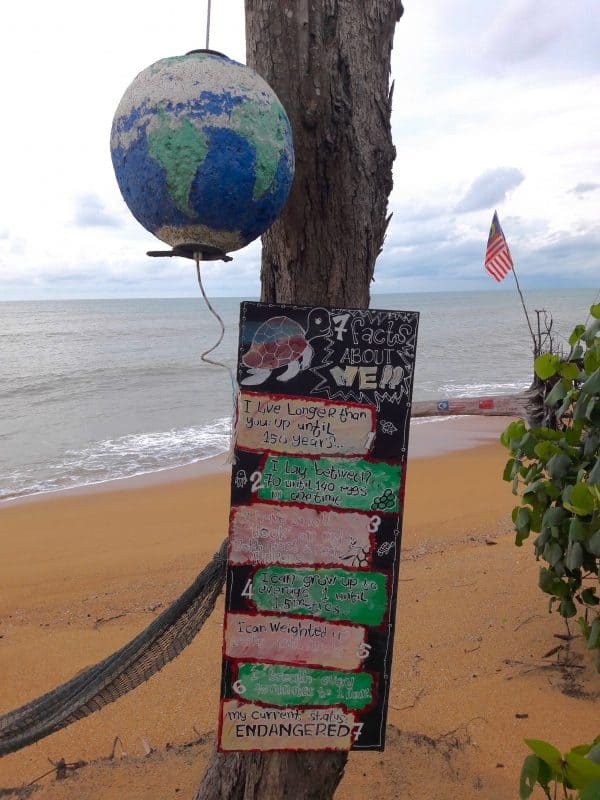 They have also recently joined forces with the Ecoteers to be included in their voluntourism opportunities allowing for visitors to join programs in Cherating Beach as well as the Perhentian islands. Just another day at the office for Pak Su. 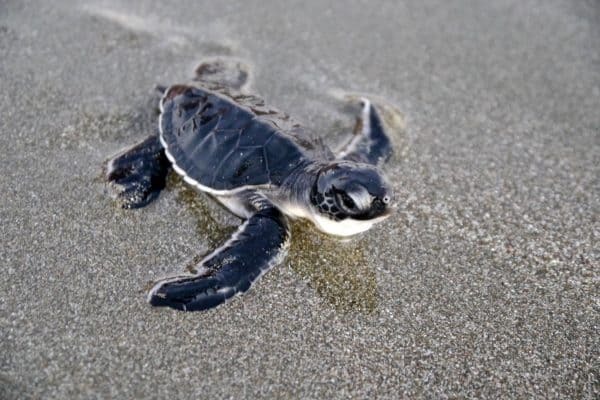 However if you do not have the time to ‘volunteer’ or spend any extensive time at the turtle hatchery, the opportunity to release baby turtles or take a hatchery tour is still available. Generally speaking, it’s not ‘free’. However, the cost can vary depending on the source of your turtle release ‘tour’. 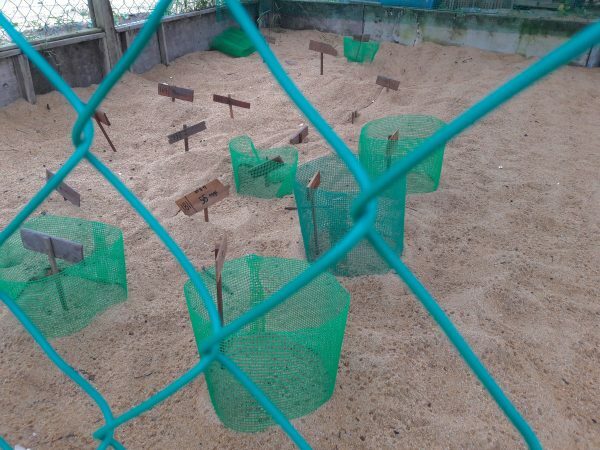 If you go straight to the source (Rimbun Dahan Turtle Hatchery) the cost may or may not be lower, but 100% of the fee will go back into the running of the hatchery programs. Instead of a percentage. Turtle release ‘tour’ is an easy, educational experience. Sea turtles are not chickens. One does not simply ‘domesticate’ them to produce food for the masses. Any turtle eggs which make their way to a wet market, were dug up from the beach (or ground) to which they were laid. Or even more shocking; they were removed from a turtle. 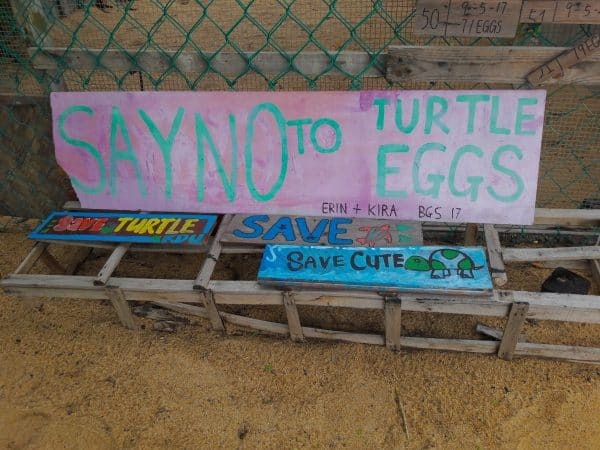 Saving Malaysian Sea Turtles, one egg at a time. Is it illegal to buy or sell turtle eggs? In many parts of the world it is indeed illegal and punishable by jail time as well as stiff fines. In Malaysia, only Sabah and Sarawak have legislation that totally protects marine turtles under the Wildlife Conservation Enactment 1997 (Sabah) and the Wildlife Protection Ordinance 1998 (Sarawak). Turtle conservation in Peninsula Malaysia is under the Fishery Department and in Borneo, the Wildlife or National Parks Department. This may make things a bit confusing when it comes to available man (woman) power and actual law enforcement. 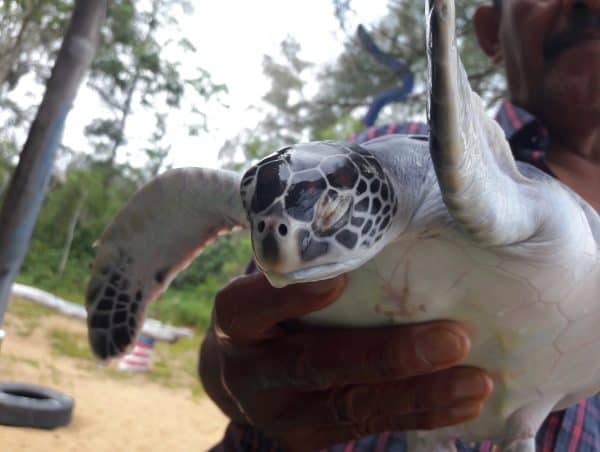 At present, only 6 states in Malaysia have legislation related to sea turtle exploitation, licensing for egg collection and possession or killing of marine turtles (Kedah, Johor, Melaka, Kelantan, Negeri Sembilan and Terengganu). Why the desire to eat turtle eggs and/or meat in the first place? Some also think turtle eggs are an aphrodisiac. Really? In the year 2017 anyone would actually believe that? What about cultural traditions? 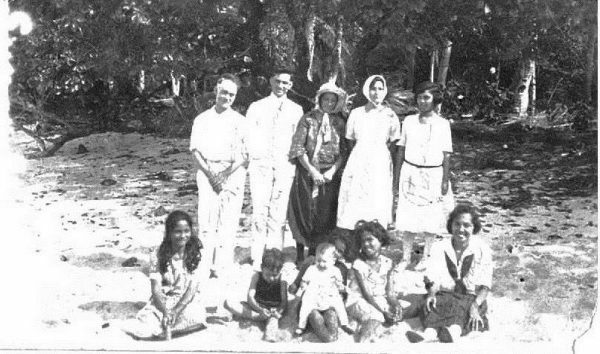 Back when my Chamorro great grandparents were wining and dining on the island of Guam, I’m pretty sure they also ate sea turtle meat and sea turtle eggs. But fortunately eating endangered species’ for the sake of family tradition is NOT something which was passed down to my brothers and I. Sometimes traditions need to be retired. Like sacrificing young virgins to volcano gods, eating shark fins for ‘health and prosperity’ or eating live monkey brains. And most definitely eating the meat and future offspring of endangered species’. It’s cruel and embarrassingly backward for any forward thinking society. That’s my grandmother standing between her mom and her sister in Agana, Guam. Does any modern person truly believe that a pinch of salt over their left shoulder will help them seal the next business deal? No. But it’s a harmless tradition. Salt isn’t an endangered species, either. Nor does it scream in pain when sliced and diced for good luck. And to be honest, seeking good health and prosperity through the various bits and pieces of wildlife probably comes with a high risk of bad karma. And if there are any bragging rights for being able to ‘afford’ such delicacies? Those same connoisseurs should also tack on the bragging rights that they helped eliminate yet another species from the planet. Other ways you can do your part for Malaysian Sea Turtle conservation? Say no to turtle egg consumption and be mindful of your beach rubbish; particularly plastic bags and straws. Great post Vanessa. Articles like yours expand awareness and let folks know how to help….in addition to letting sea turtle egg eaters know that they are literally killing off the species. The more folks gain awareness, and know what they are doing, they will refrain and also, sharper laws will be in place to punish these dingbats. Even if people don’t believe the numbers are declining, they are still dingbats in my eBook. Loving what you are doing. We visited an awesome sea turtle conservation center at the national park in Penang. So much fun. Thanks Ryan, I’m embarrassed that I hadn’t even realized how critical the situation had become (world wide) until I visited Pak Su.I also didn’t realize Penang had a conservation center, so I’ll be sure to check them out next time I’m in Penang.Now that I know where and how I can help, I’m ready to volunteer! 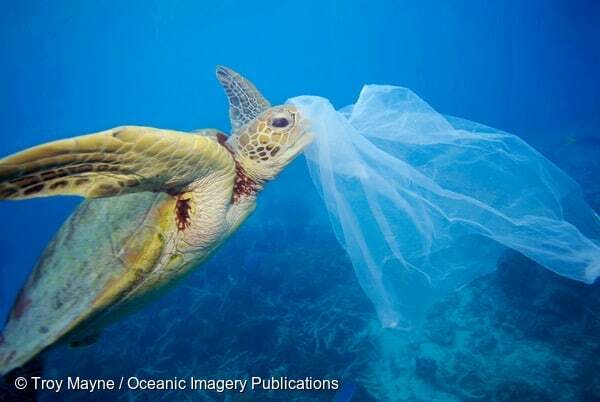 The picture of the sea turtle with the plastic bag says it all for me. We all need to be so much more careful with our waste! As for eating sea turtle eggs, if I’m honest, I wouldn’t have realised there was an issue before I read your feature. I had no idea that there were different types of turtles. Such a fascinating article. Thanks Fiona! I learned a lot while researching this post. I was unaware of the actual importance of sea turtles in the eco system and it’s quite tragic to see their numbers declining so dramatically. Thanks for sharing this post! Yes, everyone should be aware that these turtles should be protected due to the rapid decrease in numbers of these turtles. Everyone in this world especially the ones who visit the beaches, should be responsible always whenever they eat food wrapped with plastics or drink with their straw, they should dispose their trash in to the trash bins not into the ocean. Also, they should really stop from now on eating turtle eggs. Whoa such exotic creatures. Sad that their numbers are diminishing. So interesting that Hawksbill eat sponges and help corals… it is kind of a life chain there. I wish people would stop hunting them. That sight of plastic bag with turtle is so sad. Great post with a strong message. Very informative post, I did not actually know that people eat sea turtle eggs! Maybe I haven’t come across any because I haven’t travelled to places where it’s a cultural tradition to do so and I am surprised that it happens. Thanks for all these facts and figures. I admire the people who are doing their best to conserve the sea turtles. Thanks Medha! Yes I was quite shocked to actually see sea turtle eggs for sale, especially when I found out it was illegal. But then I thought, well someone must be ‘farming’ them or something. I had no idea until researching for this post that it takes up to 30 years for a sea turtle to reach sexual maturity to even lay eggs, and no way anyone has a ‘chicken coop’ of sea turtles laying eggs for the markets. Hopefully more of these not-so-fun-facts will circulate more through the mainstream to help others become more aware of the issues. This is such a great act to do. I also visited a turtle hatchery in Sri Lanka. We loved seeing how the locals help the turtles to survive. I m glad the same thing happen in Sri Lanka too! It s really a noble cause. I didn’t know Sri Lanka was doing turtle conservation, that’s good to know as I’m hoping to travel there this year. I’d be very interested to see their hatchery. Vanessa Kudos for bring this article on conservation. We once spent some time on the coats of Maharashtra with society that was into conserving Olive Ridley sea turtles and I can quite understand the hurdles including poaching by humans and hunting by animals.. I think an idea is already shaping up in my mind as to what to do this year! Thanks Nisha, I was happy to learn that volunteering didn’t necessarily mean weeks of commitment so I am looking forward to squeezing in some hands on volunteering this year. Malaysia or elsewhere. I feel rather ignorant that I was so previously unaware of the importance of sea turtles. Amazing how visible the turtles are in the waters of the Perhentians! I had no idea that Malaysian waters were home to so many species of sea turtle. So sad that they’re all facing extinction. It’s incredible to hear about people like Pak Su Cherating and his Rimbun Dahan Turtle Hatchery, and it’s great to know that they get the help of interested volunteers. I would love the opportunity to release baby turtles or take a hatchery tour, and would be happy to donate to such a worthy cause. Thanks for the article! Perhentians are lovely, but it can get a bit crowded during the major holidays. 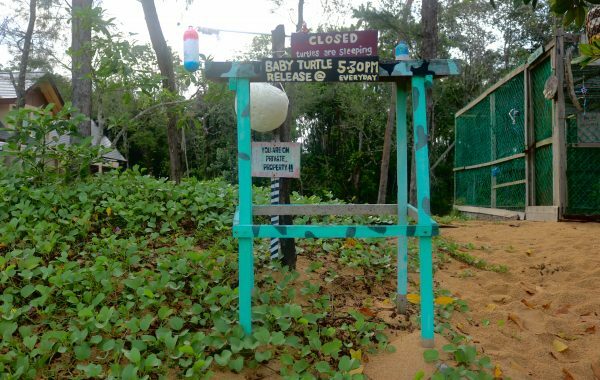 I haven’t visited the turtle hatchery in the Perhentians yet, but do know they are doing amazing conservation work there. They are also combining efforts with Pak Su Cherating in spreading the word about turtle conservation in general. This was very interesting to read. It is such a shame that some people in the world want to eat these beautiful creatures and their eggs. But it is nice to know that a lot of people are also trying to stop it. That was an interesting read and we didn’t know there are 7 varieties of a turtle, out of which 4 are found in Malaysia. The other facts too are really interesting too. But the consumption of sea turtle eggs came as a shock to me. Green and leather ones are really beautiful. The situation really needs to addressed seriously and conservation of sea turtles too. Great post with a great message. Considering how few turtles actually make it to adulthood, the consumption of their eggs by ‘intelligent’ humans really is shocking. Very informative article about the lovely species of turtles. I was not aware that the Malaysian Sea was home to so many varieties of turtles. It is so important that the endangered species are protected and all stakeholders do their bit to ensure that these species thrive in a conducive environment. I am always awed by the Olive Ridley turtles and coming to know that they are found in the Malaysian sea too is quite interesting. Thanks Sandy N Vyjay! I was pleasantly surprised myself to discover Malaysia was a sea turtle magnet.I do hope the powers that be start taking extra steps to protect them. I also hadn’t realize the importance of sea turtles to the marine environment. Great crash course (if I dare say encyclopaedia) on Malaysia’s sea turtles. It’s really disheartening to see the photo of the turtle eating plastic, mistaking it for a jellyfish and it goes to show how a single plastic life can take a life away ? Thanks Dan, it took me nearly 5 years to go visit Pak Su in Cherating Beach. I wish I had managed to visit sooner. They had to relocate since I visited but hopefully not too far away from the beach. They are suppose to begin the nesting season now (March). You take a look at that side article about Terengganu and the Leatherbacks?